Most speakers will suffer from tension or fear of public speaking at some stage in their career. This might range from having pre-event “jitters” through a sense of foreboding to an outright panic attack. The latter is very rare. The trick is knowing how to overcome your fear of public speaking. Regardless of the scale of your fear of public speaking there are things that you can do to manage the situation. These tips will help. They will certainly help you to overcome your fear of public speaking. They aim to get you speaking with the confidence you need to be effective. Be Prepared. Most of your concerns about a speech can be eased with preparation. That’s certainly the case with wedding speech nerves. Because when you are fully prepared, rehearsed and familiar with your subject, you have the perfect tonic for nagging worries and self-doubts. Look at the audience. Clearly there are some speakers whose fear of public speaking doesn’t let them speak at all. And, there are some speakers whose nerves fray at the very beginning of their speech. But note that if you are one of them, you are in the majority. This is a normal behaviour. When it happens take a moment to look out into the audience. Then, find a friendly face. Then, acknowledge them and find another friendly face. It helps. Meet your audience. If you have the chance to meet your audience before you speak then you should. Try to meet up for coffee during one of the intervals. Or mingle with the audience before they come into the main hall. When you have actually met your audience it’s amazing how much easier it is to then speak to them. Perhaps it shouldn’t be that amazing since your knowledge of an audience is a prerequisite for an effective speech! Breathe. Undertake some breathing exercises before you are ready to speak. That’s before you take the podium. So, breathe deeply and slowly and allow any tension to flow away. This works because correct breathing is essential for a good speech and it will calm any tensions you might have. Coincidentally, it was the same advice given to US athletes in this Michelle Obama speech. Be positive. Aim to be positive. Remind yourself that your audience wants to listen to you, your views, your points and your opinions. So, remember that you are the most qualified person to speak on the subject. Remind yourself that you know the most. You are the most professional. Boosting your own self-esteem prior to an event is very important. Afraid of speaking in public? 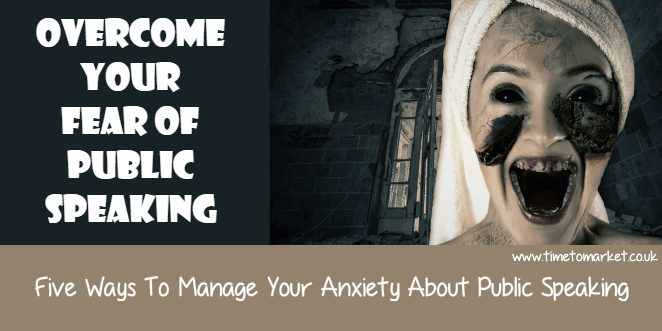 Then it really is time to find out how to solve your fear of public speaking. Be prepared and you will be in control. Look at your audience, because some of them are actually human. Meet your audience before you give your speech, talk to them and have conversations. Breathe deply and don’t let your breathing get out of control. Be positive…remind yourself of your abilities. Pre-speech nerves are entirely natural. All speakers, if they were brutally honest, would admit to having nerves before an event. Because public speaking anxiety is everywhere. Your job as a speaker is to manage those nerves. Channel all that loose energy into a well-delivered speech. There are more tips to help you overcome your fear of public speaking on a PresentPerfectTM skills training course. And because we hold courses and coaching sessions at more than 40 UK training venues, you won’t be too far away. So, when the time is right, please don’t hesitate to call.